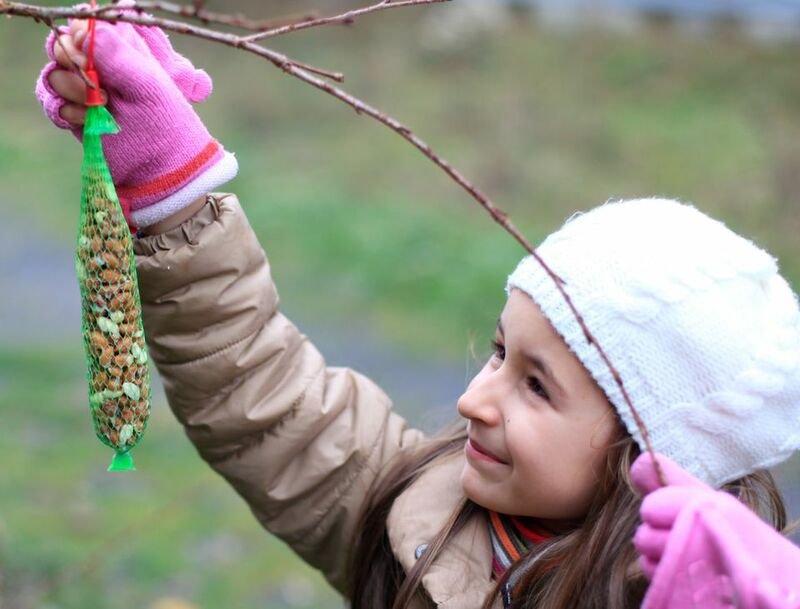 If you're looking for a fun craft project that will let your child explore science and nature while their creative muscles get a workout, try making your own bird feeder. There are plenty of simple bird feeder plans that are easy for kids to make, from a pine cone bird feeder to a toilet paper roll bird feeder. Most of these feeders use materials found in your home or after a quick trip to the grocery store. These bird feeders is that they continue to bring joy long after your little one has created it. Hang the bird feeder in a spot in your yard where you can enjoy it and watch the birds eat. As with any craft that you do with your child, make sure you read through the instructions prior to starting the craft. Then, lay out all the supplies and cover all work surfaces first with old newspaper or a tarp. These crafts can get messy, so if it's an option, work outside. Gather up a few pine cones from your yard and tie strings to the top of them. Tip: Do this step first, as the pine cones can get sticky and messy! Using a butter knife, have your preschooler spread peanut butter or cooking lard all over the surface of the pine cone. Roll the pine cone through a bowl of bird seed. Hang the pine cone from a high surface, such as a tree or a porch. This one uses a stale bagel, so it's great if you have leftovers from a brunch party. Cut the bagel in half lengthwise and secure it with a string or ribbon through the hole. Have your child spread either peanut butter or cooking fat over the bagel. Dredge it through the bird seed. Hang the bagel in the yard. This is a great craft for working fine motor skills. It also makes use of any stale round cereal you might have in the house. Take a long length of string and tie a knot at the end that big enough so the cereal can't drop through. Ask your preschooler to put circle-shaped cereal, such as Cheerios, onto the string. Once the string is full, tie the ends together and secure it to a tree or porch. Start saving your empty toilet paper and paper towel rolls. This is a great recycling project to teach kids about reusable materials. Run a long piece of string through an empty toilet paper roll and tie together at the ends. Have your preschooler smear peanut butter all over the surface of the roll. Roll it through bird seed and hang your toilet paper roll bird feeder for all to see. Another fun project, this is a good use for those oranges that have been around a little too long. You will be using the orange peel to create a hanging boat for the bird seed. Cut an orange in half and clean out all of the fruit and pulp. Take care not to rip or tear the rind. Poke two tiny holes across the diameter of the orange, directly opposite from each other. Thread a string through and secure at the top. Fill the orange with a mixture of peanut butter and birdseed (or lard or leftover cooking fat) and hang. Use this project to create a temporary bird feeder that the kids can decorate however they like. Clean and dry an empty milk carton. Cut a hole big enough for a bird to fit. Punch a hole in the top of the feeder and thread a string through. Tie at the top and secure. Let your child decorate as she wishes. Construction paper is fine, but it will likely get ruined in inclement weather. Instead, try acrylic paint or crayons. Once the bird feeder is dry, fill with birdseed and hang.